I was 19 and in my second year of college. I'd just gone through a ridiculously painful breakup where the guy didn't just break up with me, he moved out of state and gave me no way to get ahold of him. Having always been the person doing the breaking up, this was a devastating blow. I did a bit of rebound dating thanks to friends who were happy to set me up with friends of their boyfriends. It was the fall semester and I was the stage manager for a show at school. They'd brought in a paid lighting designer (someone already out of school) and the director was beyond excited to introduce us. But before introductions could be made, everyone involved in the production gathered to take this photo. After everyone went back into rehearsal or off to class, the director introduced me to the lighting designer. Right there, on those steps, in front of that theater. The lighting designer, as you may have guessed, was none other than Michael Chase. He seemed a little arrogant and tried awkwardly flirting with me. He had 90201 sideburns almost to his jawbone (from the original 90210, not the current one), and he was wearing jeans that were waaaay too tight. And, he was four years older than me. Which is a lot when you are 19. I didn't hear angels singing or see stars and rainbows when I saw him. Michael, on the other hand, heard and saw them loud and clear when he saw me. During the rehearsals and the run of the show, Michael proceeded to ask me out every time he saw me. I came up with increasingly creative ways to say no. During one of the shows while I was calling the cues over headset, Michael threw a paper airplane at me in the stage manager's booth. 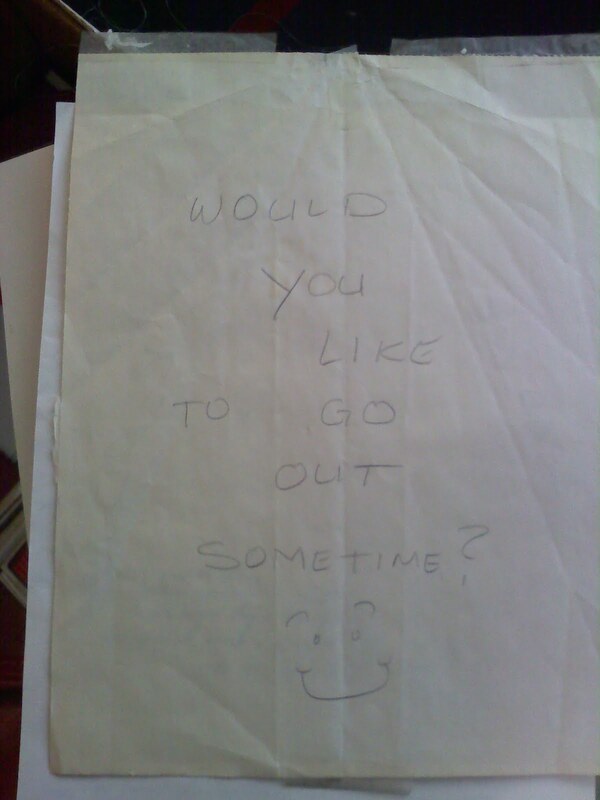 I opened it, and found he'd written, "Would you like to go out sometime?" on it. I was flustered and said over headset, "Are you in kindergarten or something?" My friends on headset all giggled with me when Michael commented, "I was thinking that was closer to 5th grade." The actual paper airplane, saved all these years and recently discovered in a box in the garage. I taped it to the wall above my bed while we were engaged, the tape still remains. The second I called the last cue for the curtain call, I ran like the wind out of the stage manager's booth straight into the women's dressing room. There I bumped into my friend Keith (it was after the show, no one was undressed that I can recall). I was out of breath and he was sipping a beverage. He asked me about my breathless state, and I proceeded to tell him about this guy who was so stinking persistent in asking me out, and how he was really starting to creep me out and how he dressed funny and how he'd even thrown a paper airplane at me while I was trying to do my job. He asked me who this horrible person was. I said, "Michael Chase." Keith, mouth full of beverage, did a spit take. And then he doubled over in laughter. Not seeing the humour, I asked him to explain. He put his hand on my shoulder and very seriously said, "Go out with him. You will never in your life meet a nicer guy. I have known Mike forever, and I promise you that he is not a creepy guy and you will never regret it." This was not what I wanted to hear. As the cast and crew said their goodbyes and left, I took my stack of cards and flowers and went home. When I opened the cards, I found one from Michael. It was quite impersonal, simply thanking me for my service on the show. And then, almost as an afterthought, he'd tucked a post-it note in the card, which said that he knew I was busy (my common excuse for not going out with him), and he was sorry to keep bugging me, but if I could ever even find just ten minutes to have coffee with him, he would be beyond thrilled. I nearly sunk into the ground with guilt. I felt like the world's worst person. I was pond scum. I felt like a stuck up snob who thought she was too good for a guy whose worst fault was he had a bad sense of style. But I didn't know how to make it right, especially since I really didn't want to go out with the guy. At the time, I was living in a tiny bachelor apartment. A one bedroom unit had opened up, and I decided to move into it. The only downside was it didn't have a refrigerator. Not wanting to go by myself to buy a refrigerator and finding all my friends were in class or otherwise busy, I pulled out the Thank You card from Michael, and dialled the number on the post-it, asking if he'd like to go shopping with me. He was at my door in minutes. He took me to all the major appliance stores, where I didn't find anything in my budget. He also drove me around the South Bay and up to the sea cliffs in Palos Verdes, and around the Lloyd Wright designed Wayfarer's Chapel, stunning in the moonlight. And during this time, we talked. And we talked and we talked and talked some more. We talked about everything. 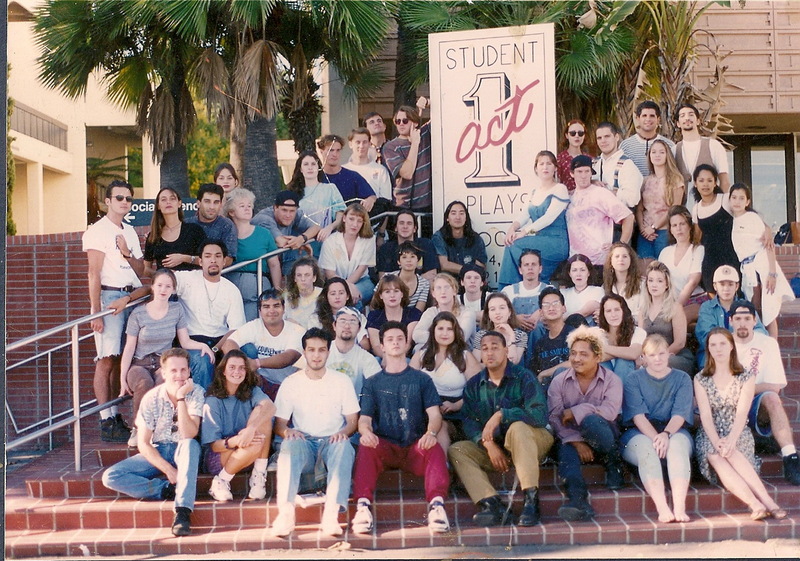 Our childhoods, our passion for the theater, our dreams and hopes and goals. I was stunned to find that we were similar in both large and small things, and that the conversation (once he stopped trying to flirt with me) was easy. Not a single awkward pause. He was a perfect gentleman, opening every door for me, not creepy at all. And he made me laugh, and except for sleep, there's nothing I love to do more than laugh. We literally talked all night, as he drove and drove. When the sun came up, he finally took me home. I was sad to say goodbye and jumped in the shower to get ready for work. I thought a lot. About Michael, yes, but also about how you can change a person's clothes, but you can't change a person's character. And about how I hated being judged by my looks (if you're a pretty blond, you must be dumb), yet I was willing to turn someone away over long sideburns which can be trimmed. After my work shift at the mall, I bought Michael a long sleeved, button up shirt. A hip and fashionable shirt that didn't scream "I come from the 80's!" like the rest of his clothes. I put it in a box and waited a week to finally give it to him. He also waited a week to tell me that his father owned an appliance store, and he could have taken me there first and gotten a great deal on a refrigerator (which he later did), but he was afraid our "date" would be over if I got a fridge at the first stop. I was still casually dating a couple other people, and still didn't know how I felt about Michael. As I recall, my main emotion was fear! I'd just gone through a miserable break up. What was I getting myself into? I was taking a theatrical lighting class and doing quite poorly, because it was all math and geometry, subjects I hadn't done well in. So I did what millions of girls before me have done to get a guy to do what they want: I batted my eyelashes and flirted back at Michael, complimenting him on what a great lighting designer he was and would he be willing to help me with my light plot so I could pass my class? He did. And angels starting singing. And I broke it off with all the other guys. And I went on a real and proper date with Michael (to Disneyland, of course!). And I started seeing stars and rainbows. 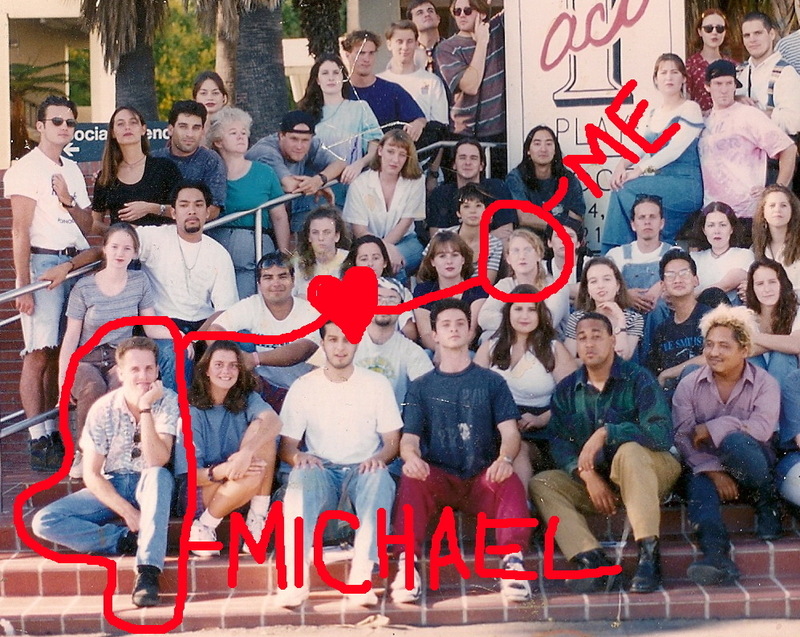 And four months from the day in that photo, Michael asked me to marry him. And I said yes, so long as we had a long-ish engagement due to the whole only-knowing-him-for-four-months thing (I was wise for 19). And today, though we are on two different continents, we celebrate fifteen incredible years of marriage, during which I have purchased 100% of Michael's clothing. And as our friend Keith promised, I have never for one minute regretted going out with Michael Chase. P.S. A couple years ago, our friend Michael Yarbro (in the upper right corner of this pic) posted the original photo on facebook. It about knocked my socks off, knowing that out there in the world there was a photo of the very day Michael Chase and I met, and that someone we knew had it. He tagged everyone in the photo, and then just this past Christmas, seventeen years later, he sent us the original. I absolutely treasure it, at least as much as that faded paper airplane. Thank you, Michael Yarbro! Love it! and love you guys! I heart this story, and you guys, so much. This photo has some pretty incredible opportunities for thought bubbles. I wonder why it was taken in front of the 1 Act sign. And I wonder why "our group" looks so trilled to be there; Especially Jeni. And I wonder why several girls over on the right side across from you guys look like they were photoshopped in. Beautiful story! Love the part about fashion from the 80's and dad owns an appliance store.